Filter by Standard Limited Ed. Awakened by the End of Days, Death, the most feared of the legendary Four Horsemen, embarks upon a quest to restore mankind, and redeem his brother’s name. Along the way, the Horseman discovers that there are far worse things than an earthly Apocalypse, and that an ancient grudge may threaten all of Creation. 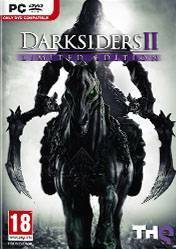 Darksiders II starts at nearly the same time as the start of the first Darksiders. After War is convicted and sent back to Earth by the Charred Council, they inform the other three Horseman of his fate. The Horseman Death, knowing that his brother War is the most honorable and incorruptible of the four, and would never have started the Apocalypse early, flies into a rage. Believing his brother is victim of a conspiracy, Death defies the Council\'s orders and sets out on a personal mission to find proof of his brother\'s innocence. Death travels to the Nether Realms, a place between Heaven and Hell, to call in favors from powerful beings that rule the realm.